Mario Balotelli’s profligate start to his Liverpool career continued on Sunday as the striker drew yet another blank against QPR at Loftus Road. The €20 million summer signing from AC Milan wasted a number of superb chances before missing an open goal in the second half with the score at 1-0. Having seen Adam Lallana skip past a challegne on the edge of the box and test Alex McCarthy with a stinging low drive, the ball fell to Balotelli but he could only send the ball sailing over the crossbar with the Rs goalkeeper sprawled on the ground. Fans and pundits alike subsequently mocked the striker and the miss served to typify what has been a nightmare opening to the season. 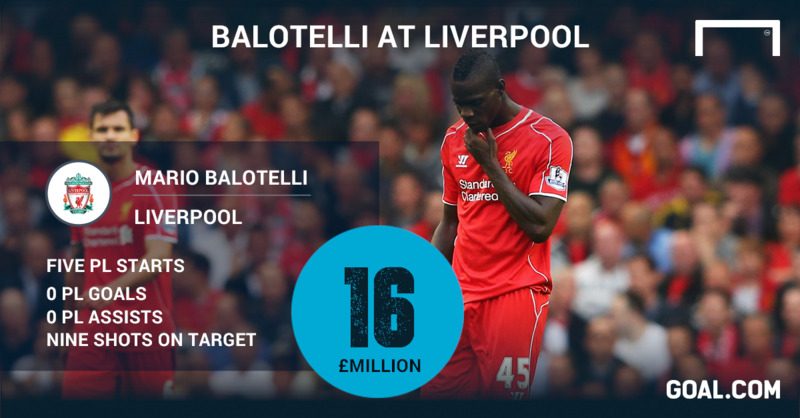 Here, Goal looks at the numbers behind Balotelli’s dismal first few months on Merseyside.